Oh, Vancouver, you look so stunning from above! Your incredible views of white and silver skyscrapers with magical mountains in the background and glorious waters, almost completely surrounding you, are irresistible! No one can visit you without seeing your spectacular vistas from the top at least once. Unfortunately, with just a few days to explore the city for the first time, our chances to enjoy those splendid views were close to zero. One slight possibility though loomed somewhere far on the horizon. It gave me not firm, but at least some hope to get a bird’s-eye view on this British Columbia gem. “It’s better than nothing,” – my enthusiastic side encouraged me to pursue this dream. And so my husband and I did. The rewards exceeded all our expectations. We were able to admire this lovely city from above not once, but quite a few times. With that being said, grant me the pleasure to present to you our top picks on the best views over Vancouver for the fist-time visitors. Most of us have travel budget we want to adhere to as much as possible. Traveling doesn’t mean that we have to overspend. Thus I’ll start our overview with the most inexpensive and gradually move to the priciest options on the list. Let’s begin. Among ample parks and recreational areas in and near Vancouver, Queen Elizabeth Park stands out as one of the most favorite spots to observe the spectacular city from above. According to every Vancouver residents, this is quite understandable. There is no secret or mystery behind it. Naturally, the location of the park plays a crucial role in attracting over six million visitors yearly. People, who just like us, follow their strong desires to explore the British Columbia jewel from the top. And I can inform you with certainty that Queen Elizabeth Park knows how to reward them. As the highest point in Vancouver (170 feet above sea level), the horticultural public garden astounds with the glorious view of the park, city, and majestic mountains on the North Shore. Two viewpoints guarantee different perspective of one of the worlds’ beautiful cities and its surrounding area. 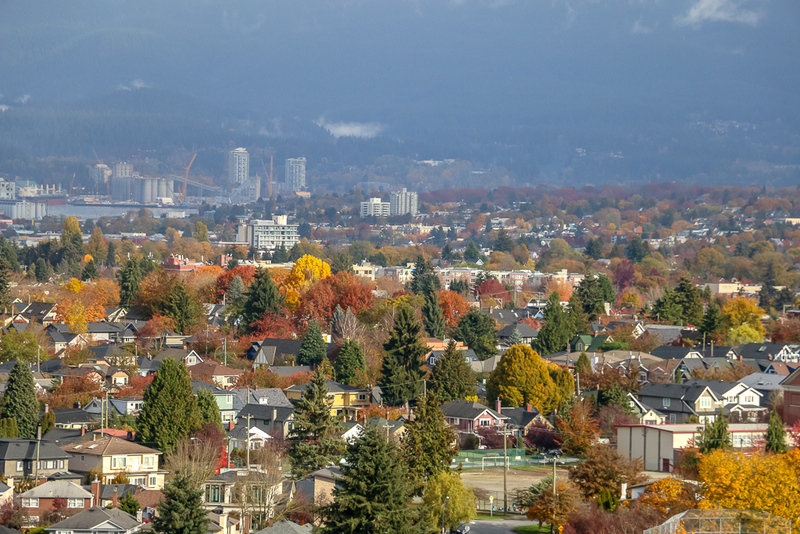 The first, along the back side of parking lot, looks straight down at Burnaby, the third-largest city in the province, located immediately to the east of Vancouver. The second observation point is difficult to miss. Head in the north direction from the Bloedel Conservatory and enjoy the awe-striking vistas of the city from the top. Besides the dazzling views, Queen Elizabeth Park offers plenty of opportunities to reconnect to the nature. Have great time and enjoy blooming flowers in spring and green lawns in summer, play with colorful leaves in fall and make snowmen in winter. The second popular park in the city is free. However, all drivers (which might be the best option for a first-time visitor to explore everything Vancouver has to offer) must pay parking fee. Typically, it ranges from $2.50 CAD per hour or $7.00 CAD per day from October 1 to April 30 to $3.50 CAD per hour or $13.00 CAD per day from May 1 to September 30. Not a big price for a place with such extraordinary vistas. 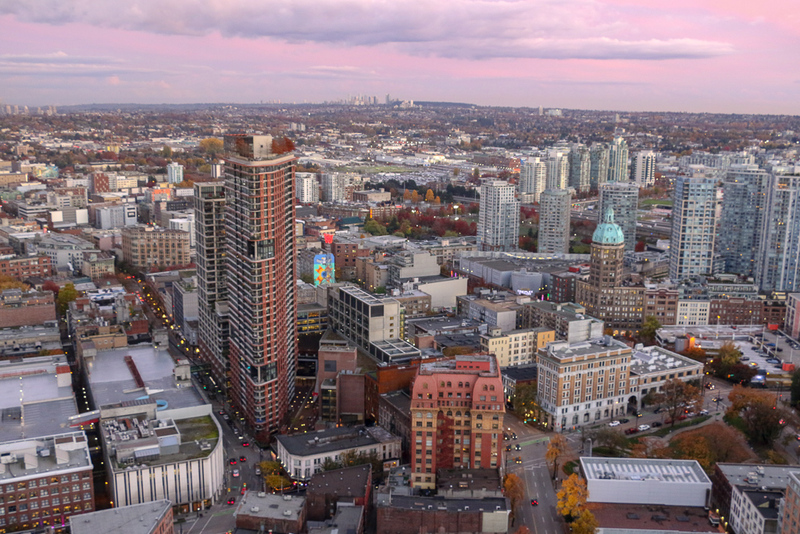 Have you ever seen “flying saucer” inherent in majority of images of downtown Vancouver and wondered what it is? 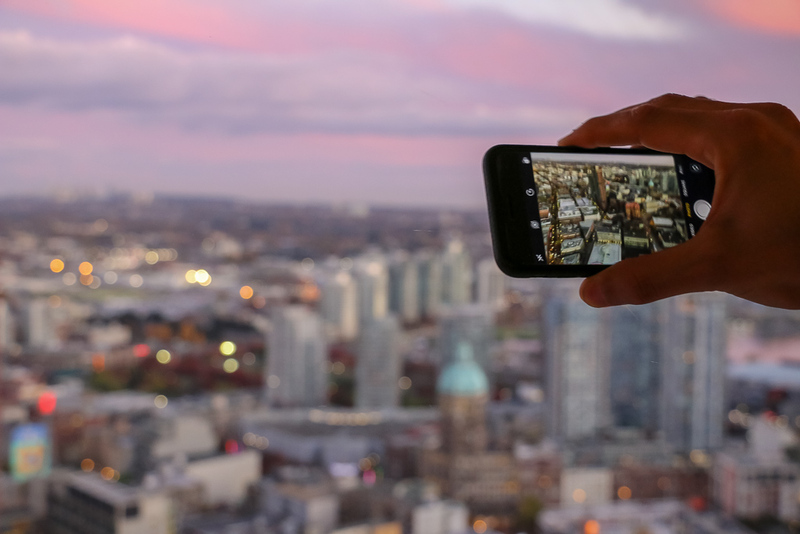 Allow me introduce you to Vancouver Lookout – your go-to place for a 360º aerial view of the city. Journey to the remarkable vistas at a 553.16-feet height starts with a 40-seconds elevator ride. Slowly then faster and faster, the glass box moves skyward unveiling tall downtown building before taking you to a famous observation deck – a place where the panoramic vistas of the bustling Vancouver, the Pacific Ocean in the distance, world famous Stanley Park, the epic North Shore Mountains and the Olympic Peninsula Mountains become a reality. Even though, no one will ask you to pay for the use of the elevator, the entrance into the iconic “flying saucer” is limited to those who, upon request, can proudly show pink stamp with the words “Vancouver Lookout” on their wrists. For $17.50 CAD you can get your own lucky imprint on the first floor of the building. But make sure not to wipe out your hands clean after leaving the tallest tower in the city. Since the tickets are valid all day long, you have the right to come back and enjoy the city from above as many times as you can only handle and afford considering your busy itinerary as a first-time visitor. Grouse Mountain is better known as a world-famous ski resort. 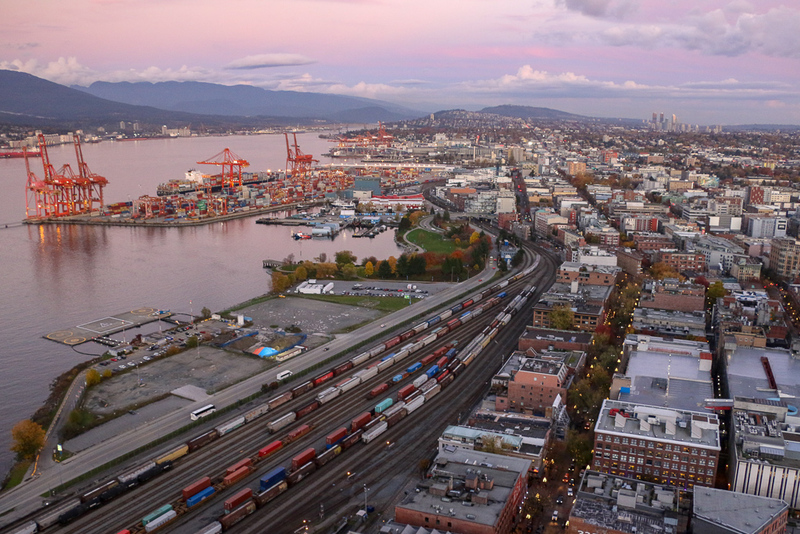 But when is comes to finding the best view of the city from above, this North Vancouver‘s jewel certainly gets one of the first places on the podium. The stunning views of downtown Vancouver, Coal Harbor, Stanley Park, and the surrounding mountains unfold themselves the moment you step on observation deck at the Chalet located about 3,700 feet up on the top of Grouse Mountain. The best way to conquer such a great distance and reach the Peak of Vancouver is via Skyline, North America’s largest aerial tramway system. For over 25 years, this incredible attraction has been giving millions of visitors the chance to admire the breathtaking vistas of the city of Vancouver, magnificent Pacific Ocean, stunning Gulf Islands, and snowy peaks of the mountains. The Skyline operated 365 days a year. A round trip up and down Grouse Mountain will cost you $56 CAD. Discounts for seniors, kids, and families are in effect. As an alternative way, you can hike Grouse Grid, a 1.8-mile trail up the face of Grouse Mountain, and take the Skyride down. It will save lot of money and give your body, especially your legs, an amazing workout session. However, at the same time, on the way up, you risk to miss the gorgeous views of the city the way only the Skyride presents them. The hike also asks for longer time spent at the mountain, which might be an issue for somebody with limited time in the city. 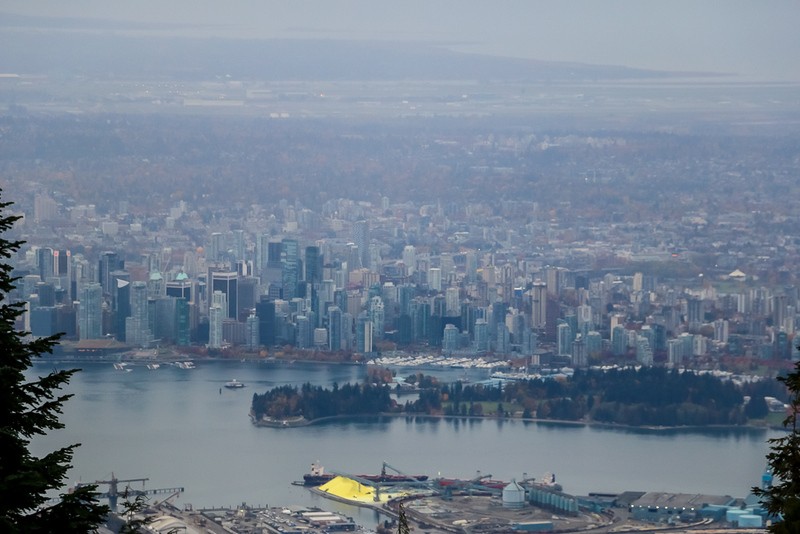 Seeing Vancouver from the top is one of the most epic ways to explore the city. Just reviving those images in my mind makes me want to go back and enjoy the scenic vistas over and over again. Have you ever seen Vancouver from above? If not, make sure to do it as soon as possible. Vancouver Lookout. Views from above.